Naan bread, olive oil, ricotta, mozzarella, basil, garlic powder. Can you handle this 15 minute recipe? I think so. Forget waiting 45 minutes for a $15 dollar pizza when you can get a personal pizza at home in less than 15 minutes with simple ingredients you can get at any grocery store. 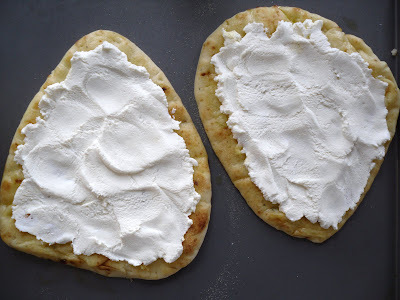 My idea for this recipe was originally from an issue of Wegman's magazine (Wegman's is an awesome Northeast grocery store) and ever since trying their naan pizza recipes, I've been hooked on my own version of white naan pizza. 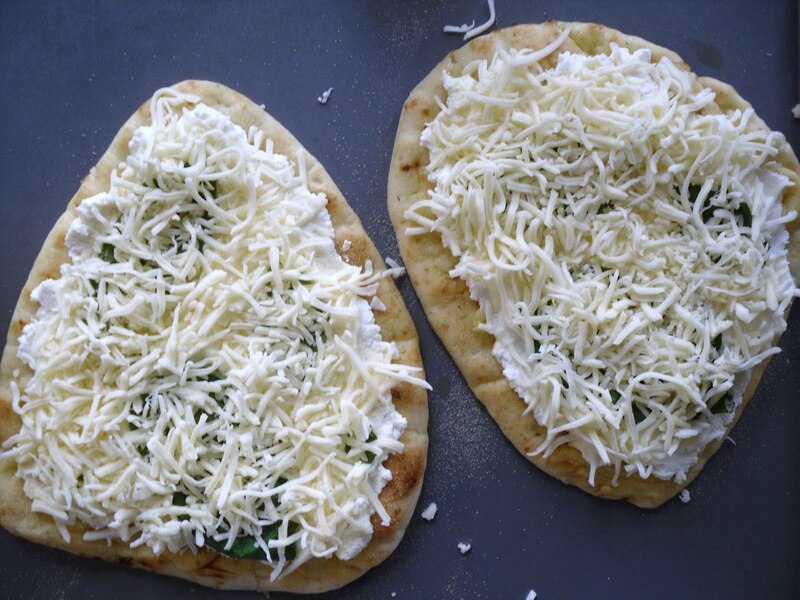 See more naan pizza recipes from Wegman's here. Naan is a South Asian flatbread that is commonly seen in Indian and Pakistani restaurants in the US. And of course, it's complete natural for us (Americans) to take a century old recipe from ancient civilizations, cover it in cheese and salt and call it a pizza. Mmmmm, pizza. 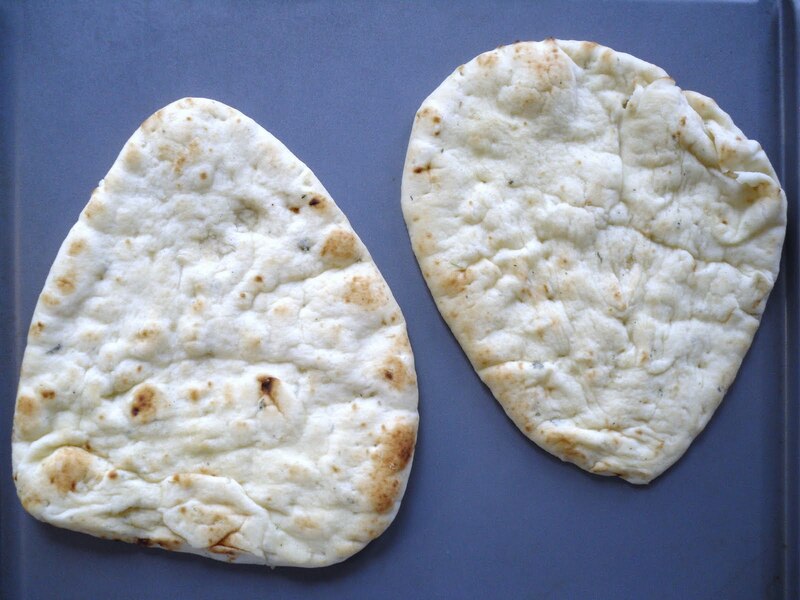 You can find Naan bread at most grocery stores now, pre-packaged and ready to use in a number of recipes. I bought Tandoori Naan, and I particularly like the garlic flavor for this recipe (it also comes in original and whole grain). Find out if this is available at your local grocery store. The size of the naan is perfect for a personal pizza, so take this in consideration for serving sizes if you plan on making only this flatbread recipe with no sides. This mild, garlicky, and herb-y white pizza will pair well with almost any white wine from Champagne to Sauvignon Blanc, so I won't even name grapes - just pick up a bottle of your favorite white. 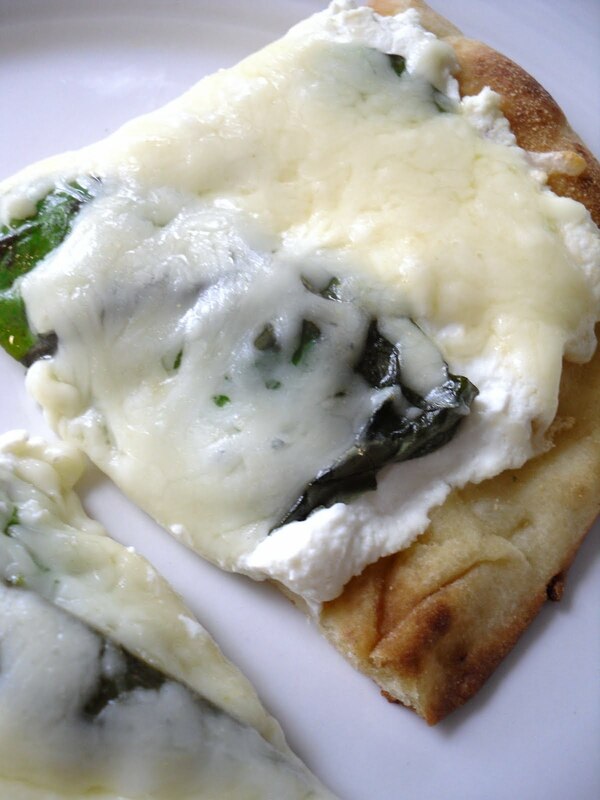 If you prefer red, I almost always opt for an Italian Sangiovese or Chianti when eating mozzarella and ricotta cheese. 2. Arrange naan on cookie sheet. Brush each naan with 1-1/2 tbsp olive oil. 3. Spoon 3/4 c. ricotta cheese onto each naan and spread, leaving 1/2 inch "crust". 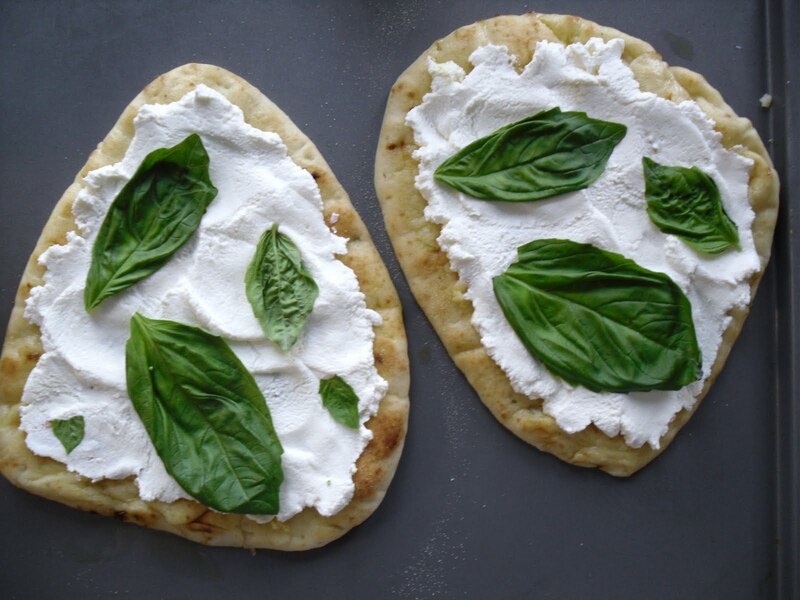 Though the whole basil leaves were pretty, chopped basil will be much more user friendly when trying to take a bite out of your pizza. 4. Either using whole basil leaves or a few tablespoons of chopped basil, place basil on top of ricotta and press in slightly. 5. 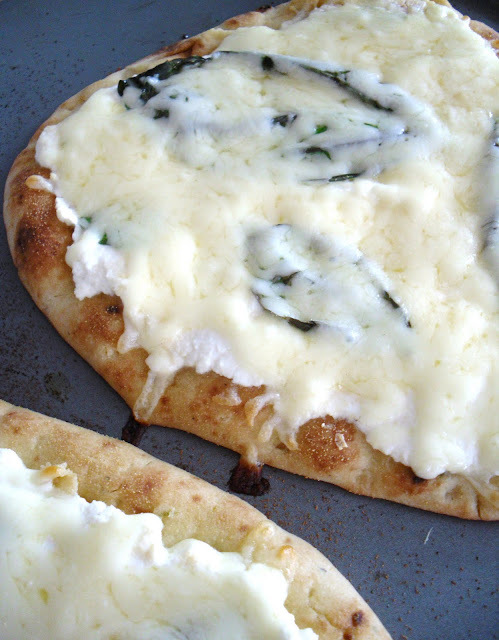 Top each naan with 3/4 c. mozzarella cheese. Sprinkle with garlic powder, if desired. 6. Bake naan pizzas for 8 minutes, cheese should be melted and bread should be slightly crisp. Remove from oven and allow to cool for 5 minutes before cutting. 7. Cut each pizza into 4 slices and enjoy! Thanks for sharing this recipe it's definitely a really good reward for my brother who got his Food Safety Course last week. But still work on the dough first. I'm not really the cook-type but I'd like to do something special for him. YUM! This looks so good. I am going to try the cheese topping on my recipe for garlic and basil flat bread. Thanks!